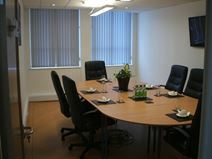 This modern business centre in Bury provides various sized offices on very flexible leasing terms. There are complete reception and security services, meeting rooms, and on-site parking. Offices are accessible around the clock. The centre lies just off the A56 Manchester Road, a mile from junction 2 of the M66. Business centre providing newly refurbished office suites of a high specification available on flexible lease terms. All with air conditioning, state of the art telecom and IT facility, meeting and boardrooms and also car parking spaces available on-site. Located in Bury Town Centre 9 miles from Manchester City Centre, easy access to the M66 Motorway connecting directly to the M60. Direct Metro Link service to Manchester with a tram stop 5 minutes’ away. Located just 10 minutes from the centre of Bury, this modern fully serviced business centre offers a large and dedicated support team, an up-to-date IT and telecoms infrastructure, and free car parking both for tenants and visitors, as well as an onsite gym and cafe. Bury offers a range of eateries, bars and coffee shops, including Costa Coffee and Pizza Express, as well as connections to Manchester Piccadilly via the MetroLink service. Ideally suited to a single corporation occupying the whole building, this business centre offers an private yet fully serviced and bespoke corporate environment with excellent amenities, including laboratory, gym, café, plenty of parking, and high-spec IT and telecoms. It is within walking distance of Bury town centre, which offers a range of shops, cafes, restaurants and bars, as well as transport links.